This yarn was calling to me to be made. the yarn spun slowly on my Wee Peggy and then wound onto my niddy noddy before soaking and setting it with a weight to dry overnight! Next up – Hebridean Heavens – this one will be all blues, dove greys, rust brown and ice whites…. 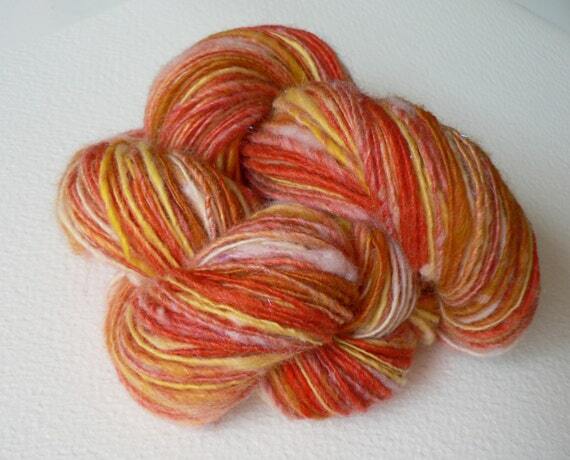 After a long break due to painting commitments I have got my mitts on fiber again. This time – no rushing – just blissful spinning. My fave thing to do it colour blend using my hand held carders. I look at my bookshelves full of fiber tubes and pick a bit of this and a bit of that – mixing fibers and colours as I go. I create over 9 rolags usually per single skein that I spin on my Wee Peggy original wheel. It is a joy to see the colours develop as I card – I never tire of this. Then I lay them all out on a board by my side and pick up random rolags and spin. I love the adventure of this and the unpredictable results of colour blends I get. I love to see all that I have fiber-wise on view – know what I mean? Seeing an array of colours and fibers plus angelina just gets me into orbit. So – I had a few grossly oversized and accidentally bought (on Ebay where the photos were a bit deceptive!) cardboard tubes. They were being moved from here to there in my house. Always in the way but I was loathe to throw them away as they may come in useful…well indeed they did. Please see BEFORE and AFTER pics of a corner in the workshop part of my downstairs knock-through. I know some of you STABLE girls may snicker at the feeble excuse for what I call my stash but – at least I am actually using mine and not using it as an alternative to roof insulation. So there! Now I am inspired and shall be carding , spinning and either knitting squares or weaving my produce till it is ALL gone and then I will have earned a blinking good spending spree and start all over again. Do you have pics of your stash? Go -on I know you do – so let’s see ’em. Send to eastwitching@hotmail.com and I will feature them here….with a prize of my bestest handspun yarn for the WORST case of fiber hoarding. Don’t know what happened but I was just sitting daydreaming after having a cup of tea this afternoon and this silly idea occurred to me. For all those with a love of sheep and the fiber fun they provide us I have created a jazzy sheep image and thanks to the people at Society6 it comes in mobile cases, laptop covers and greetings cards as well as prints. I painted the original sheep in watercolour and then added a flamboyant mauve background and some creamy coloured text. With summer really trying hard now to catch up and push forth its colours and flowers my backyard full of ferns inspired me to spin a graduated single – in all shades of green. Finished skein “Frond” 185 yards single at 15 wpi and 50g it is a delicate little soul. Hanging about under my garden arch drying and lightly weighted to keep kinks at bay. After spending ages warping up this over 6ft project I get to the actual weaving bit and realise that a section of thicker warp just will not lift and open into a shed! This 6 inch section of thick warp threads will not disengage to form a shed! 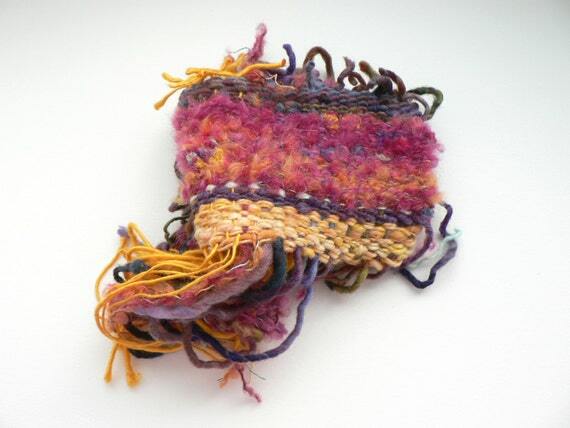 Tried everything – tightening the tension onto the back bar and opening it by placing thick yarn and even card into the first section of weft – all to no avail. My reed is 7.5 and all the rest of the warp yarn is fine as they are not so thick – but the last right hand section is way to thick I realise now. Should’ve used a 5 reed for the whole thing perhaps or just not used such wildly differentiated yarns in my warp! So – with a deep breath I cut that whole section loose! Luckily it was just a whole edge and that yarn appears nowhere else in the warp. So – the shawl will be 6 inches narrower but it is still a nice ample and generous width. A few inches worked and it seems to be holding together ok. I have worked a few picks and already I am settling down to liking the patterns that are appearing and pretty colour blends as they appear – phew!!! I am saving the many yards of this gorgeous two ply alpaca which is so soft it takes your breath away and will use it all up in my wefts. I like the patterns and blends that are emerging. That eternal magic element of weaving – surprise!